Despite the fact that this mid-range scanner has been out for some time, the 3200F really is something of a speed demon. It can preview a full page of A4 colour in under four seconds, and will scan a full 300dpi A4 colour document in just 13 seconds flat. Of course, you will need a USB 2.0 port built into your Mac or added on via PCI card, otherwise you're back to USB 2.0 speeds. The 3200F is quite long in the body and has four large EZ buttons at its front. The buttons can be configured using Canon's excellent CanoScan Toolbox software that enables you to assign a scanning task to each of the buttons. 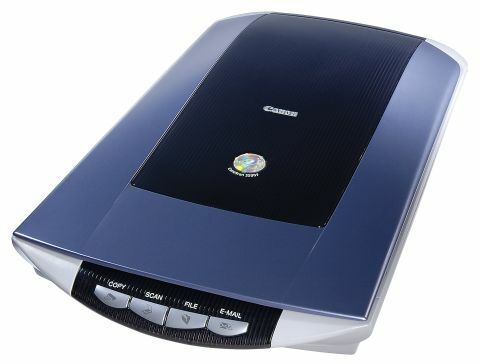 Once programmed, the buttons can instantly turn the scanner into a photocopier, fax machine, scan station or kit for emailing images. It's a great time-saver for a busy office. As well as scanning flat paper based documents, the 3200F comes with a film-scanning attachment for 35mm negatives or slides at resolutions up to 1,200x2,400dpi. Unfortunately, you can only scan one frame of 35mm film at a time, so there's no chance of batch scanning a whole strip of negatives. The 3200F does include QARE Level 2 software for removing dust or scratches, but the optical quality is such that the scans aren't up to the film output of comparable competitor models. So far it's a mixed bag, but the 3200F really starts to fall down on image quality. The colours are slightly off and washed out - particularly the reds - and the optical quality is lacking with serious green and red fringing on smaller pieces of white text.